From Basel to the Beehive, through rate cuts and conference calls, Crisis is a first-hand account of the global financial and economic meltdown as experienced, observed and interpreted by Alan Bollard, Governor of the Reserve Bank of New Zealand. The book takes readers from the over-heated markets of 2007, through the collapse of investment banks and crises in numerous economies in 2008 and 2009, and on to the fragile recovery in New Zealand and the world during 2010. An updated edition with three new chapters was published in September 2012. ‘In a memoir titled Crisis, co-authored with historian Sarah Gaitanos, Bollard recounts the impact of the global financial crisis on New Zealand and offers a unique insight into how and why the guarantee scheme was put in place.’ — Brian Fallow, New Zealand Herald, September 6 2010. ‘Sarah Gaitanos has put human dialogue over the financial rhetoric and made the book accessible to those with no banking, economic or financial background.’ — Janet Whittington, The Nelson Mail, September 18 2010. ‘… readers will be delighted with the book’s honesty and transparency. It is a damned good read.’ — Brian Easton, Listener, September 18 2010. 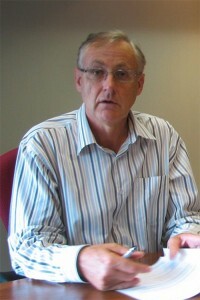 Alan Bollard, during an interview in January 2009. ‘For anyone interested in the New Zealand economy, this book is a must. It is highly readable, with just the right amount of detail.’ — Don Brash, Dominion Post, September 4, 2010. I found it unput-down-able. It is an amazing book, making headlines that were terrifying and unsettling at the time comprehensible now. It is also remarkably intimate. Co-writer Sarah Gaitanos, orchestrator of the book … is a gifted oral historian who encouraged Alan Bollard to relax and “speak” on his most confiding, most humanly understandable, voice. Reading it, I found it surprisingly easy to identify with this remote figure, and see the crisis in a different way. — Joan Druett, Straddling the World of the Written Word, September 25, 2010. No. 6, Nielsen weekly bestsellers list, 18 September 2010. 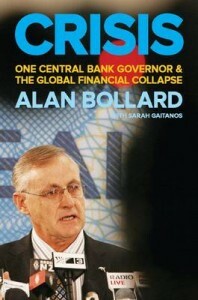 An updated edition of Crisis with an additional preface, three new chapters and an extended timeline was published in September 2012, at the time of Alan Bollard’s retirement from the Reserve Bank of New Zealand. This edition is also available as an e-book. Available in all good New Zealand bookshops and online at Fishpond and Auckland University Press.